Franchise Fever: Christopher Lloyd stars in a new Back to the Future short. Trainspotting 2 will shoot next year. Lionsgate wants a Cabin in the Woods sequel. The Enchanted sequel will be titled Disenchanted. Watchmen might become a TV series. Sony is making an animated Ghostbusters movie. Marvel Madness: Kevin Feige gave updates on Captain America, Spider-Man and more. And an update on Captain Marvel. Casting Net: John Goodman joined Kong: Skull Island. Ellar Coltrane joined The Circle. Nat Wolff will star in Death Note. New Directors/New Films: Matthew Vaughn will direct the spy movie I Am Pilgrim. Guillermo del Toro is making a small movie next. Remake Report: Paramount is remaking The Man Who Shot Liberty Valance. First Looks: Matthew McConaughey in Gold. Box Office: Adam Sandler is box office gold in animated form. Distribution Deals: Drafthouse will re-release the previously obscure movie Dangerous Men. New Movie Trailers: The Revenant, Spectre, The Assassin, The Forest, The Choice, Love, Doc Brown Saves the World and Burnt. Watch: An Avengers: Age of Ultron deleted scene. And an Avengers: Age of Ultron gag reel and honest trailer. And Avengers: Age of Ultron summed up with Lego. See: Chris Evans and Hayley Atwell star in a couple’s marriage proposal. Watch: Hours of NASA video answering questions about The Martian. See: What a Spider-Gwen movie starring Emma Stone would look like. Watch: A Nancy Meyers movie parody starring Jason Mitchell. See: Matt Damon recreate his movie career in eight minutes. Watch: The first and last shots of movies side by side. See: Every Jean-Claude Van Damme kill through his movie career. Watch: A video showing how film scores affect our brains. See: A bold new Hunger Games: Mockingjay – Part 2 poster. And classic horror movie posters come to life. Fantastic Fest Reviews: The Wave, Man Vs. Snake, Green Room and Tom Hiddleston in Crimson Peak and High-Rise. 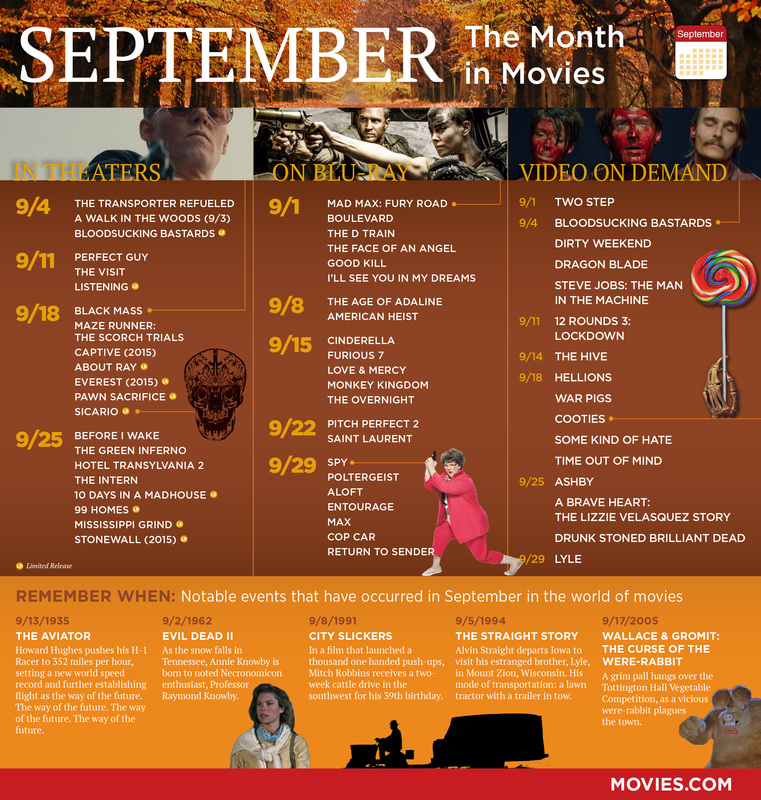 Monthly Movie Release Guide: See everything arriving in theaters, VOD and more in October. Interview: Drew Goddard on The Martian. Virtual Reality Guide: The Walk VR experience is the best we’ve seen yet. Upcoming Movie Guide: All you need to know about Revenant. Horror Movie Guide: All the latest horror news and trailers. Comic Book Movie Guide: What the DC movies could learn from the Batman: Arkham video games. R.I.P. : Remembering the reel-important people we lost in September. Home Viewing: Here’s our guide to everything hitting VOD this week. And here’s our guide to everything new streaming on Netflix this month. And here’s our guide to everything new to HBO Now.